Charles Daly was a 5-7, 150-pound quarterback who played five years and was a first team All-America four times. He played for Harvard in 1898-1900 and for Army 1901-1902. He was a first team All-America all three of his years at Harvard and at Army in 1901. In his final season, Walter Camp named him as a third team All-America. In his three years at Harvard, the team had a record of 31-1-1. Army, in his two playing years, went 11-2-3. Playing for Harvard in 1900 against Carlisle, he made a 60-yard run and drop-kicked a field goal. 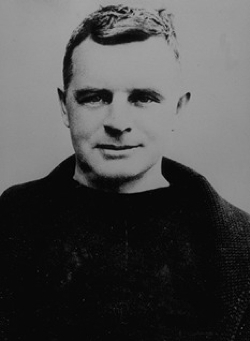 Playing for Army against Navy in 1901, he had a 100-yard kick return for a touchdown, a field goal, and an extra point – all of Army’s points in an 11-5 victory. 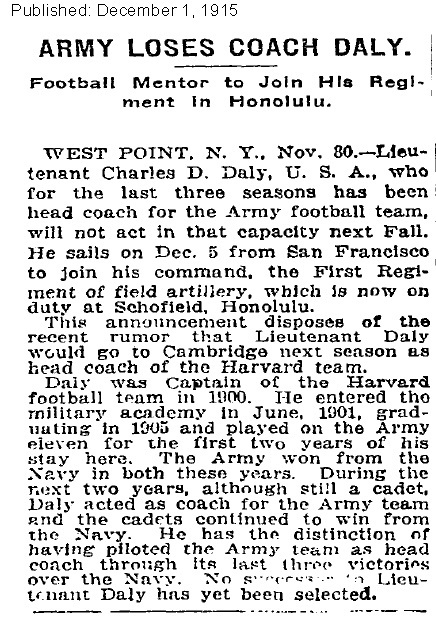 William Hanna, writing in the New York World Telegram in 1927, called Daly “one of the five greatest quarterbacks of all time.” He graduated from Harvard in 1901. Congressman John H. Fitzgerald of Massachusetts gave Daly an appointment to West Point. Daly was there four years, playing football just two seasons, and graduated 46th in a class of 114. For several years he alternated between the military and business. In 1907 he was assistant football coach at Harvard. In 1910- 1912 he was fire commissioner for the city of Boston. 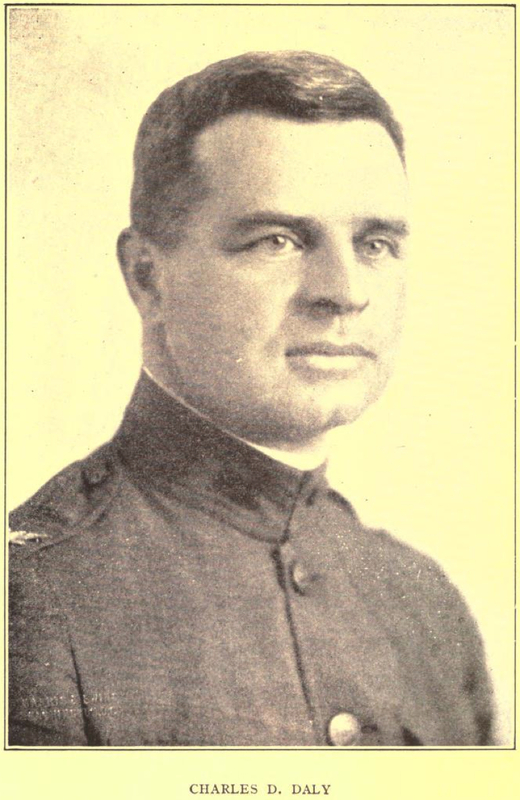 He was Army’s head football coach 1913-1916 and 1919-1922. He had a 58-13-3 record; his 1914, 1916, 1922 teams were undefeated. In 1922 he helped found the American Football Coaches Association and served as its first president. Daly was born October 31, 1880, in Roxbury, Massachusetts; he died February. 12, 1959, in Pacific Grove, California. He had three sons who graduated from West Point and two daughters who married West Point graduates. This entry was written by forwhattheygave, posted on July 27, 2010 at 1:22 am, filed under Army Greats and tagged 1905, Football. Bookmark the permalink. Follow any comments here with the RSS feed for this post. Trackbacks are closed, but you can post a comment.